Long before the End Times, when Gotrek Gurnisson’s doom was still many years away, he and his Rememberer Felix Jaeger found themselves in all manner of adventures and scrapes. Here is one previously untold story… As the heroic duo travel through the Border Princes, a drunken night coupled with Gotrek’s dwarfish lust for gold leads to him agreeing to a marriage – for Felix. With a halfling. Gotrek is determined that this will be a “marriage of moment”, allowing an unamused Felix to abandon his diminutive wife afterwards, but will she see it that way? And just what is the mysterious Jabas that the villagers are so scared of? Will hilarity ensue from this wedding… or horror? If you’re a fan of the series, then I’m sure you’ll enjoy this diversion. It’s another tale disconnected from the ‘main’ Gotrek & Felix timeline, very much a complete story. 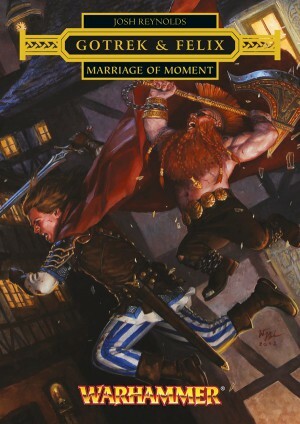 Marriage of Moment is only available through Black Library’s website as an eBook. Josh Reynolds is also the author of, most recently, The Return of Nagash, part of the End Times series, which I’ll be reading hopefully very soon.